One of the most discussed topics on the web is how to get rid of algae. Algae will take over a tank when there is an imbalance of nutrients in the environment. It has been said before that algae control is nutrient control and that fact will become more obvious as you read on. Many hobbyists see algae as an invasion. They are "like weeds", choking out the good plants and just generally messing up the tank environment. But nature cannot be blamed for what it does... it is what it is. Algae is a natural part of the water systems on this planet. Don't hate it because it happens to show up in a luxurious environment that you yourself have setup. At the very least, algae is pointing out some sort of imbalance in your aquarium setup that needs to be corrected. 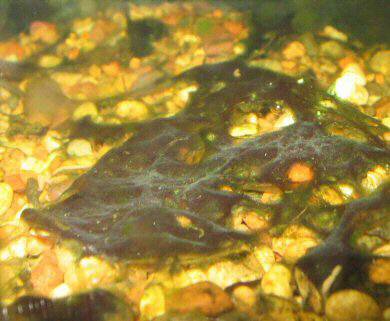 Algae can help clean water and can be used as food for fry. Before we get to the types, I would like to mention some benefits of algae. That's right, algae can serve a purpose! The main benefit of algae is that it helps clean the water in the tank. Green algae is just like the higher plants, in that it uses organic wastes in the water and produces oxygen. 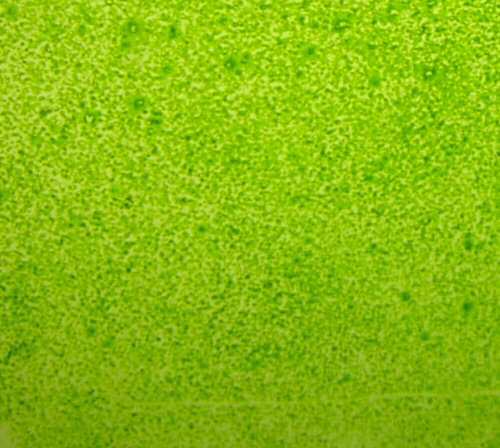 Another benefit of algae is that it can provide an alternative food source for omnivorous and herbivorous fish, especially small fry from egglayers who may sometimes survive on "green water". Here is a list of the most common types of algae. Staghorn algae looks like thick strands that may branch once or twice until it ends. The color is a blue-green-grey and the algae itself feels slimy to the touch. Usually grows in high-light slow moving areas of the tank. Manually remove the threads with hand, or remove the leaf they are attached to. Lower light levels in tank. Depending on extent of growth it could look like small tufts of black hairs, or a black carpet (as in the picture). The strands don't ever get very long, one centimeter is the usual size. It usually forms on slow-growing plants such as Anubias, but it can also grow on gravel. This is one of the worst algaes to get rid of. It cannot be manually removed off a leaf or other surface, the entire leaf must be removed. 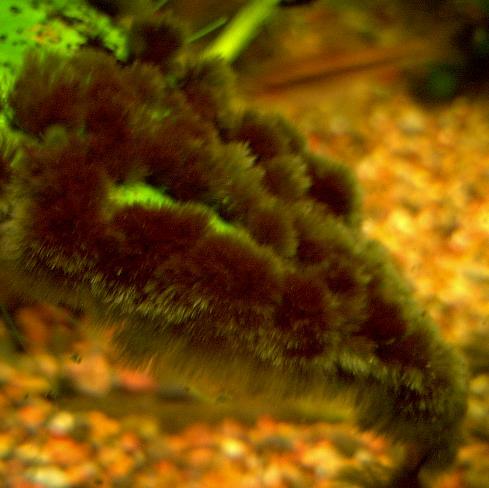 Siamensis are one of the only known fish to eat this type of algae. If you have space it is highly recommended to get these fish as they really earn their keep. Green Spot is just that, green spots on the glass or plant leaves. It usually doesn't grow in epidemic proportions (as in the picture!) and is more of an aesthetic problem than anything else. Faster growing plants will not succumb to this type of algae, but slow growers like Anubias may. 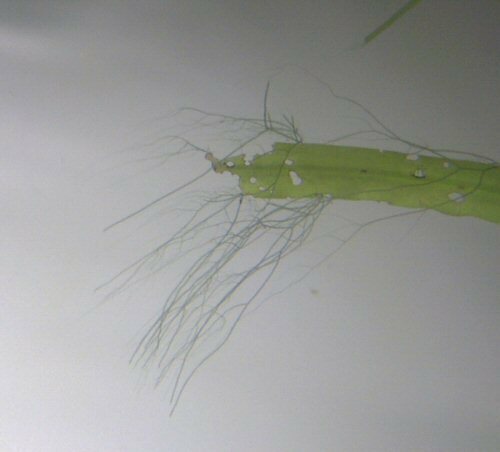 This algae can't be scraped off with a fingernail. You must use a razor on glass, or a scrubby pad meant for acrylic tanks if you want to take this off. Most rasping fish (otocinclus, plecos) cannot eat this algae as it is really fused onto the surface. Image waiting This algae can grow fairly quickly and within a few days take over a tank. It is usually in the form of long, wispy threads that can grow up to 20 centimeters. This algae can be removed manually, but it may grow back unless conditions are improved. Reduce light levels, and nutrient levels if necessary. Some algae eating animals will go after this, Siamensis , Live bearers, and even most shrimp. A single-celled algae that floats in the water column. If it grows well enough it will soon turn the tank cloudy with green. This algae can't be manually removed except by a diatom filter. It cannot be eaten by fish except small fry and perhaps water fleas (daphnia). The best way to get rid of this is nutrient control of the water column. I have dedicated an entire article to this type of algae HERE. This is actually not an algae, but a type of bacteria. It grows in thick slimy sheets, under rocks, over gravel, and can eventually cover everything in the tank. Sometimes small portions grow between the gravel and the sides of the tank. It has a "musty" odor. This stuff can be removed manually, but it may grow back unless conditions are improved. Excess waste and poor water quality is usually the fault. There's no fish that will eat this stuff. I have had good luck manually removing as much as I could from the tank, and dosing with Mardel Lab's Maracyn for 3-4 days. Mentioned above are the types of algaes, and short descriptions on what to do about them. I labelled this section How to Control Them because there really isn't a way to completely eradicate algae from your tanks. Algae exists everywhere. It can travel as spores through the air, it can come in on anything put in the tank (nets, hoses, fish, snails, live plants, etc.) There are various general ways to try and control all forms of algae, and I will go over them here. The main underlying method to controlling algae is a restriction of one or more things the algae needs to survive. What this boils down to is controlling the nutrients. Although not technically a nutrient, I will throw natural and man-made light into the mix, as this is another factor which can be controlled. As I've said before in other articles, figuring out which nutrients are out of control in your tank requires the use of a test kit. Without the use of a test kit, you will just face frustrating weeks and maybe months of "guessing games" with your tank. It could also be more expensive in the long run if you start buying products to help with one thing in particular, when really you should just be focusing on something entirely different. It is also rare for an algae problem to go away within days. It may take weeks to completely control a particular kind of algae in your tank. So it is important that you understand which nutrients are the problem, and stick with the methods to help restrict them until the algae is no longer a problem. This element is one of the building blocks of life on Earth, and is necessary in order for most things to survive (including fish and plants.) The problem of nitrogen is when it builds in excess of what the ecosystem can handle. Plants (and algae) can use nitrogen in three common forms: Ammonia, Nitrite, and Nitrate. If any of these forms are elevated, then algae can take hold. Restrict nitrogen by feeding less, keeping a lighter fish load, and doing more water changes. This is probably the most common cause of algae in most tanks. Sometimes it is exposure to sunlight which will cause algae, so try to restrict sunlight from hitting your fishtank. 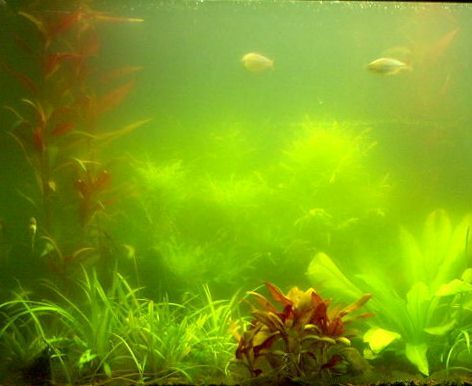 In planted tanks where more artificial light is used, it is common to have some algae breakouts if the plants are not established or there are not enough plants. If this is the case, then increase the number of fast growing plants you have, and include some floating plants to help starve the algae. This element builds up in a tank from excess fish waste. Overfeeding and heavy fishload increase this element which can contribute to algae. Sometimes well-water can have phosphate from agricultural runoff. There are products to remove phosphate from the water column through the filter, and I have found these to work well. If you happen to have a planted tank and use fertilizer meant for aquatic plants, then overdosing can lead to algae problems. Add more plants, or ease off on the fertilizer dosage and try to find a balance. Natural control of algae is always best. Algaecides can kill plants too. I hope this article has helped you in both identifying which algae your tank has, as well as using natural steps to help control them. Unless it is a sign of a nutrient problem, or the algae is taking over and killing your live plants, it is really just an aesthetic problem and the fish probably don't mind a bit! Here are some links which may help you in dealing with algae.